Unified communications and collaboration refers to integration of different communications and collaboration services like instant messaging, voice call, web and video conferencing etc., over a unified interface for optimization of business processes and increasing user productivity. According to 6Wresearch, India Unified Communications & Collaboration Market Size is projected to grow at a CAGR of over 12% during 2017-23. India unified communications and collaboration market is growing steadily year-over-year owing to growing internet penetration in the country. Unified communications and collaboration solutions have emerged as cost saving solutions providing effective collaboration thereby increasing productivity and better ROIs. Additionally, attributed to government initiatives towards Digital India, end users are investing towards the deployment of unified communication solutions, predominantly Ministries of India, Public Sector Units (PSUs), banking institutions and education institutions. While voice remains the primary means of communication, however video based unified communications registered maximum market share in terms of revenues. With rising adoption of video conferencing across all major verticals, it is expected that video based unified communications would dominate the India Unified Communications & Collaboration Market Share over the coming years. In terms of vertical, Banking, Financial Services and Insurance (BFSI) registered highest contribution in unified communications and collaboration market followed by education, government & public utilities and others. The India Unified Communications & Collaboration Market report thoroughly covers unified communications and collaboration market by technology & sub-segments, verticals and regions. 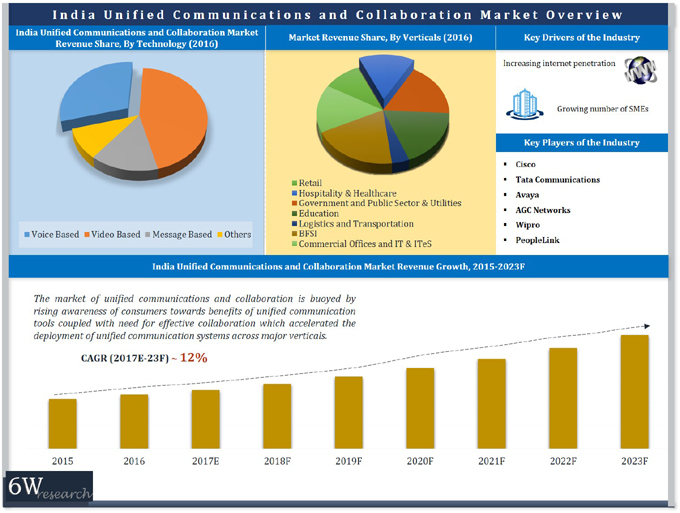 The India Unified Communications & Collaboration Market outlook report provides an unbiased and detailed analysis of the India Unified Communications & Collaboration Market trends, opportunities/ high growth areas, market drivers which would help the stakeholders to decide and align their market strategies according to the current and future market dynamics. 13.6	Peoplelink Unified Communication Pvt. Ltd.